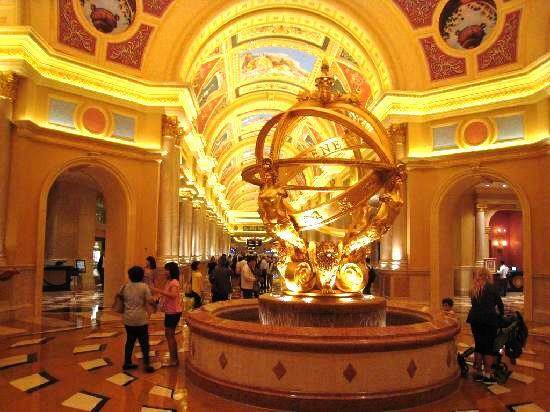 The Venetian Macao Resort-Hotel in Macau is pure luxury and opulence personified. 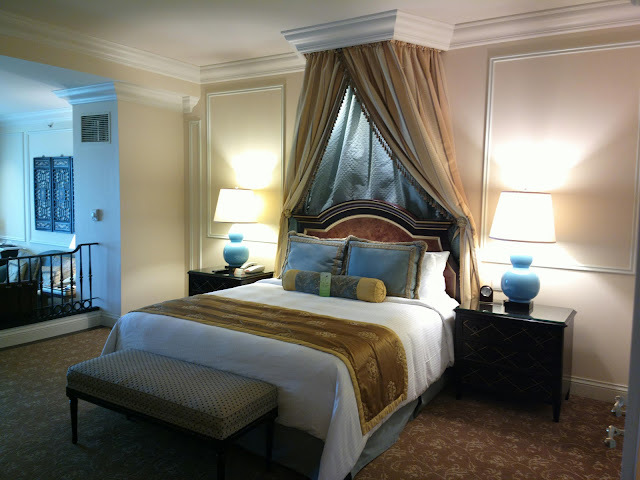 I had an absolutely splendid stay there for 3nights recently: A Palatial room, terrific view (my room was on the 23rd Floor, whoa! 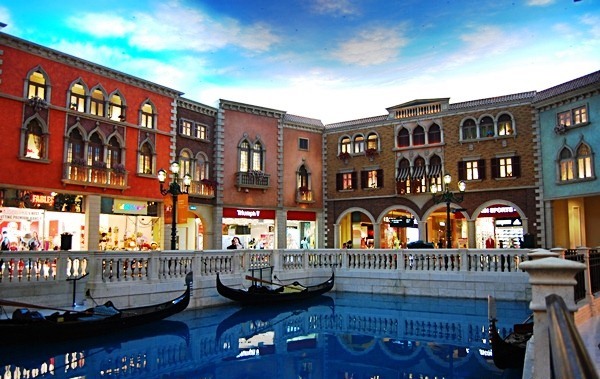 ), delicious food (plenty of multi-cuisine dishes), never-ending, beautiful shopping boulevard with the world’s best high-street & luxury brands, gondola rides and ‘The Casino’ ! I’m in the most luxurious Paradise ! London and Milan. I was absolutely bedazzled by the place and here are the pictures and highlights of my vacation there ! 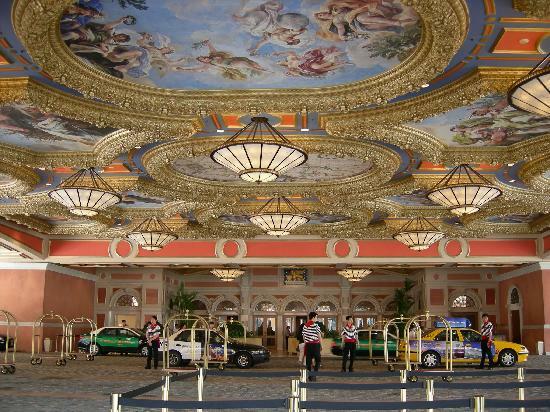 I was wowed from the word go, the Main Lobby was just a prelude to the exquisite grandeur I was about to witness. The Golden Globe Statue was just spectacular and I vowed to get a picture here later. I was so thrilled as soon as I arrived there, I couldn’t contain my excitement, inspite of the long journey to get there. That included my plane journey to Hong Kong and the subsequent ferry ride from Hong Kong to Macau. 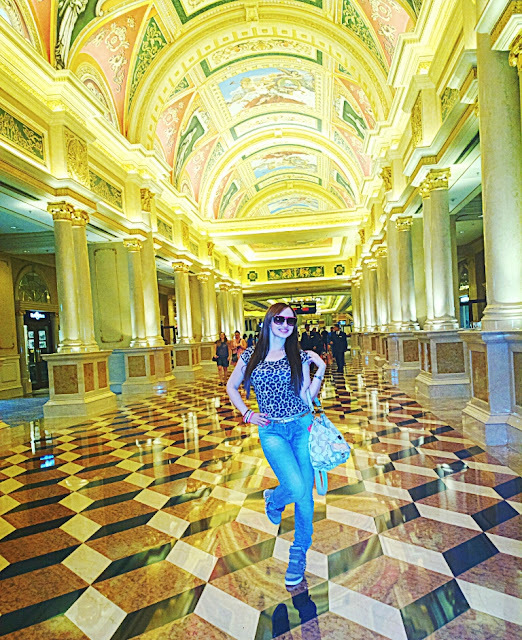 Here I am at the spectacular Golden Hallway connecting us to the Casino Area and the Suite. 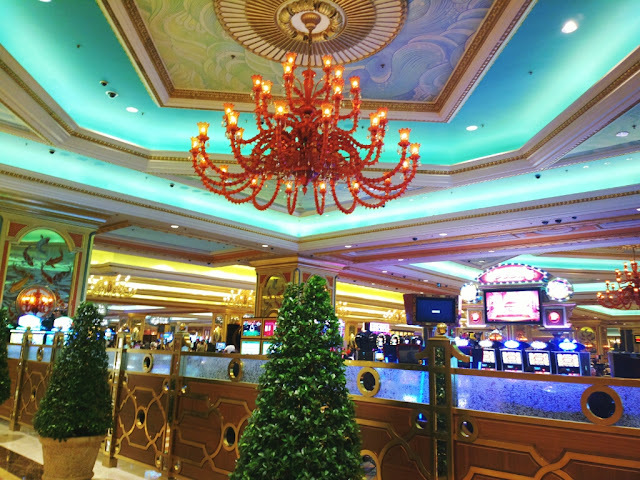 The attention to detail at The Venetian Macao is pretty impeccable. I loved strolling along the Golden Hallway under a ceiling of faux Renaissance paintings. Next I passed through the larger than life Casino Area, bustling with eager gamblers. Being not much of a gambler, I still promised myself to return later for some fun. The next day I did try my hand at some Black Jack and even won couple of hundreds, not bad for some beginner’s luck. I checked into the spacious split-level Royale Suites. These large suites include a fabulous king-sized bed, a living room/study, and a walk-in closet. Have a look at this regal bed setting, that I dived straight into to catch up on some much needed sleep, before I began my exploring of this sprawling resort. 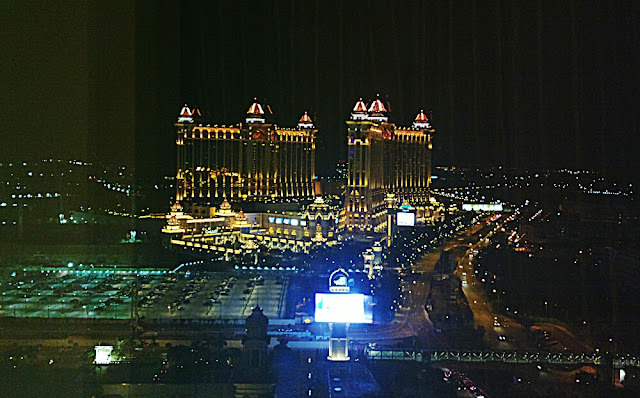 The room had an undoubtedly stunning view of the grand Galaxy Hotel . 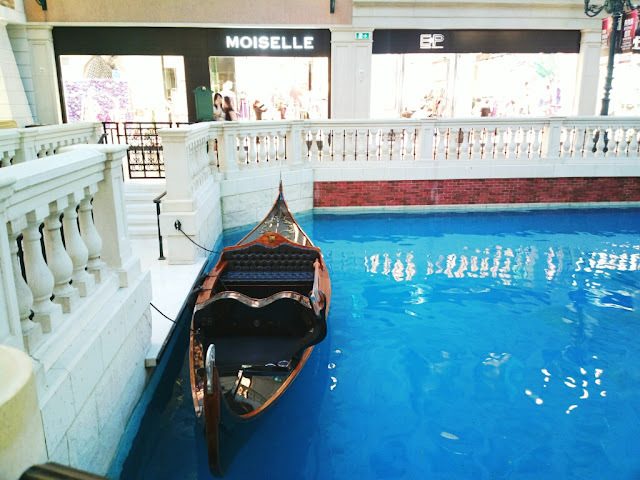 The next day I begun my eager exploring through the Grand Canal Shoppes and was greeted by blue-sky ceilings and gondolas on water. I was left speechless because it felt like I was in Venice, Italy. The ambiance was just so nice, made to look like the sidewalks of the European city, and the ceiling a perpetual mix of twilight colours. 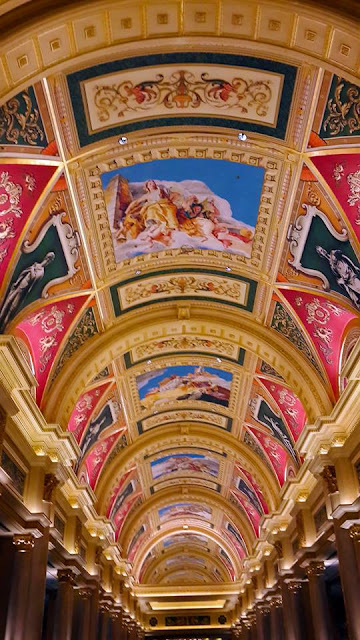 Yes, my dears, that ‘sky’ is not real, but a well-painted and well-lit ceiling. With how it was built, it seemed like we were really outside. Only this time, the sky didn’t change and it’s perpetually ‘nice weather’. I wore this pretty floral peplum top paired with a neon pink skirt and pink belt. I managed to do some decent shopping too from Guess, Zara and Bershka along the way, but expect slightly higher prices here than elsewhere . I wore these simple fun bracelets, carried my handy Snakeskin Guess bag and donned my new favourite travelling shoes – Spiked Wedge Sneakers from Aldo , so comfortable and chic. 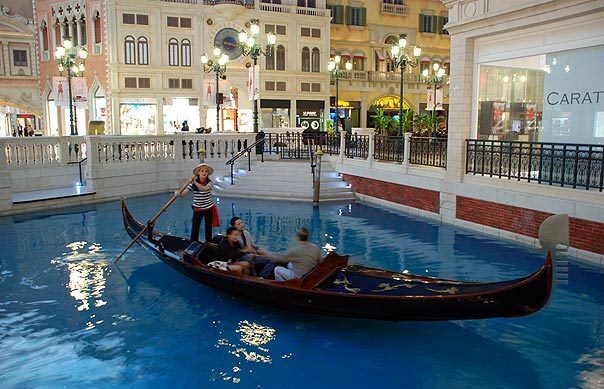 The gondolas on the pristine canals, guided by serenading opera singing gondoliers, were quite a visual treat. 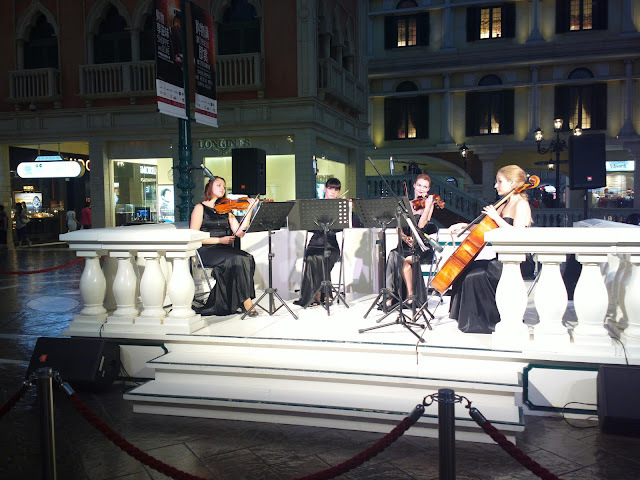 There is loads of entertainment at the Venetian, I got the chance to witness and hear a fabulous orchestra playing in the middle of St. Marks Square . 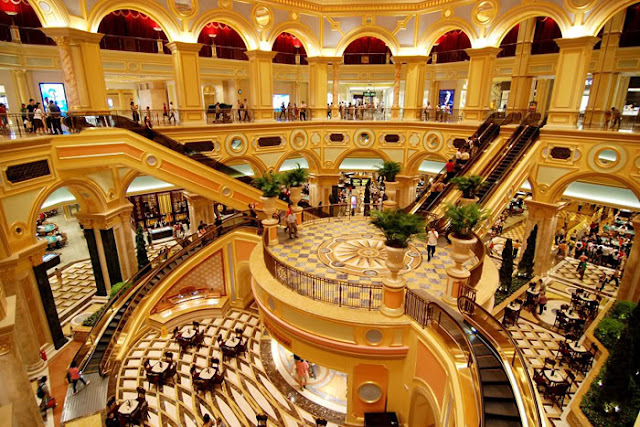 This is the Atrium connecting the casino to the mall. The shops in this particular area consists of high-end designer names, notably jewellery stores – after all, what better way to spend your winnings than splurging in some bling? Tiffany’s occupies a very nice spot, fronting the top of the escalators from the casinos. After a wonderful day of shopping and exploring the Venetian, It was time to get ready for dinner. I wore this silk River Island high low dress in shades of gold and pink, it deemed fit for the night out. I had to get a picture at this fabulous gold globe at the main lobby. 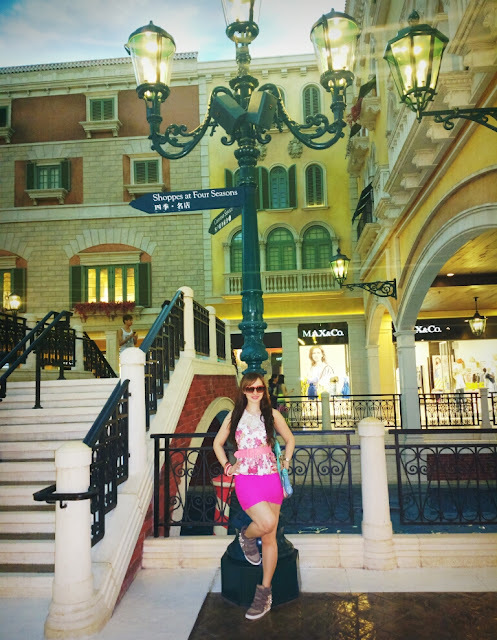 I then headed off for diner at Café Deco, a fabulous multi cuisine restaurant at the Venetian. There are a multitude of restaurants to choose from. The next night I tried out Red Dragon Noodles for a change and quite enjoyed my meal there too. 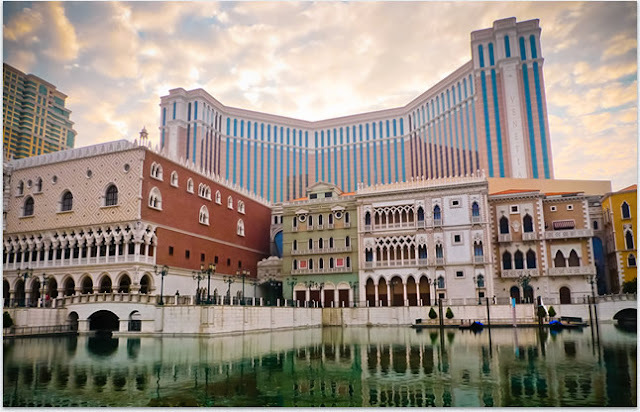 I hope you enjoyed the recount of my experiences at the The Venetian Macao Resort-Hotel, Macau, it is definitely worth a visit, with lots of interesting stuff to do. I’ve never been to Venice but the design of the hotel gave me a glimpse of what it might be like to be in the city of Italy. With lamp posts and gondola transports around, plus the beautiful architecture, you can sense that you are actually in Venice. 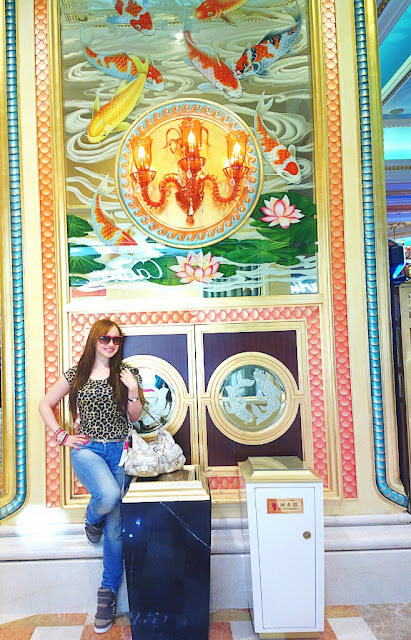 I would love to visit this bustling and palatial resort again too someday. You have amazing pictures and look beautiful. Keep in touch doll. Wow, it looks incredible there!! I have been meaning to go to Macao, just haven't quite made it there yet. I can't believe that this Venetian is 2 times the size of the Las Vegas Venetian! I already thought that one was huge. Thanks so much for sharing!! Wow, this place looks amazing!! Like Law Vegas of the East! Gorgeous photos! I'm jealous 🙂 And the largest casino? That's a whole lot of gambling! Wow, that place looks amazing! 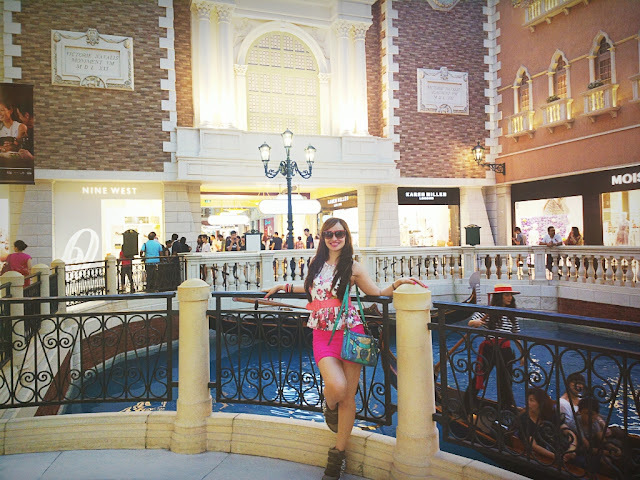 I want to stay at the Venetian in Vegas! I love your pink outfit with your wedge sneakers, super cute! I've started following you on GFC, Facebook and BlovLovin' and I hope you return the favor! WOW! That is so amazing!! I'd kill for being there! Hahaha. This place looks stunning. Looks like you had an amazing time there. Love both looks. Esp. the dress is marvelous. looks so cool and that mini Venice inside is just awesome! Just went there last year, the galaxy hotel was beyond amazing ! I loved all the shows and especially the gandola rides ! Love ur outfit , very colorful. Wow great shot, it looks like the Venetian in Las Vegas! You are so lucky to go there, great blog! Wow!! This place is really amazing!! honey i'm following ur blog (460) and waiting for Ur follow. great post and blog dear, follow each other on bloglovin? Wow, that place looks amazing and you're dressed impeccably in each picture! Love love love! Of course we can follow each other! I'm following you now on BLoglovin and I hope you'll do the same. I look forward to reading more of your posts! This place looks absolutely amazing. Everything is so beautiful. Love these photos. So stylish, so beautiful! I love your outfits!! hi dear!!!! amazing photos!!!!!! and lovely outfit!!! !